The meet hosted by St. Elizabeth at Natirar seems to be everyone's favorite; and with good reason. It's a beautiful course that is great for the runners and the spectators! We had a fun meet today where all runners showed tremendous progress. We also had four medalists and a Fun Run winner! 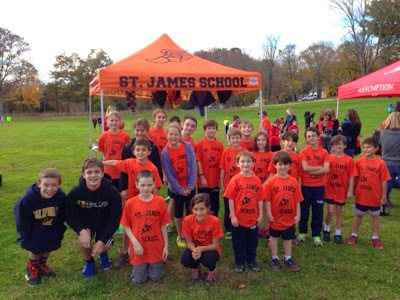 Cristo Milelli (K) placed first in the Fun Run, Athena Bernaz (4th) placed 11th, John Paul Cafasso (4th) placed 11th, James Glockenmeier (8th) placed 10th, and Clay Goulburn (8th) placed 12th. Our next meet is Saturday in Morris Plains. Just a reminder, there is no practice tomorrow with Halloween.